The H-3 Pegasus is a low-wing, open cockpit monoplane by noted lightweight sportplane designer Bert Howland. It features a lightweight fuselage, based on TIG-welded, square aluminum tubing, that weighs only 18 pounds. The internal construction of the wings features a cantilevered design that eliminates struts and cables. Powerplant range is 28 hp to 55 hp. The prototype H-3 first flew in 1988 and won the “The Most Innovative Unltralight” award at Sun ‘N Fun 1989. The design was also designated “Best Commercial Ultralight’ at the 1990 event. The H-3 is not an ultralight vehicle as defined in FAR Part 103. Gross weight of the Pegasus is between 500 and 595 lbs. 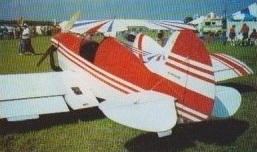 Pegasus plans cost $250 in 2009 and were available from Classic Aero Enterprises. Engine: Hirth F263, 31 hp.